Jim is an expert on national security issues, especially strategy, innovation, the effective use of military force, and the Middle East. He was the commander of the US Central Command from 2010 to 2013, responsible for military operations involving more than 200,000 US soldiers, sailors, airmen, Coast Guardsmen, and Marines in Afghanistan, Iraq, and eighteen other countries in the Middle East and south-central Asia. He commanded at multiple levels, from second lieutenant through four-star general, including Task Force 58 for the 2001 invasion of Afghanistan and the First Marine Division in the 2003 invasion of Iraq. He also served as a recruiter, commanded the Marine Corps Combat Development Command, and was the executive secretary to Secretary of Defense William Perry. 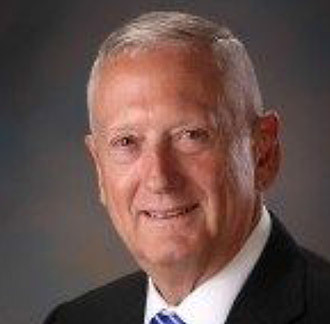 Secretary Mattis served the Secretary of Defense under the Trump Administration January 2017-December 2018.